Tommy Cooperrider joined Dubin Clark in 2017. As an Associate, Tommy’s focus is on business development and deal execution. He also assists with the monitoring and growth of current portfolio companies. Prior to joining Dubin Clark, Tommy worked in investment banking at Drake Star Partners in New York, where he supported senior bankers in executing mergers, acquisitions and private placements in the technology, media and communications sectors. 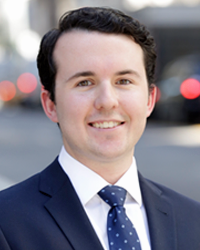 Previously, Tommy worked in the valuation and transaction opinion group at Berkeley Research Group. Tommy received a B.S. in Industrial Engineering and Economics from Rensselaer Polytechnic Institute (RPI) and an M.S. in Finance from Boston College. He is also a CFA charterholder. In his free time, Tommy enjoys traveling, playing guitar and volunteering.